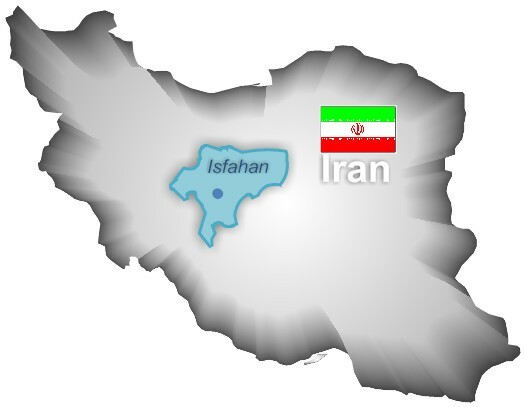 Isfahan province: (Persian: Ostane Esfahan); also transliterated as Esfahan, Espahan, Sepahan or Isphahan) is one of the 31 provinces of Iran. It is located in the center of the country. Its capital is the city of Isfahan.The province of Isfahan covers an area of approximately 107,027 square km and is situated in the center of Iran. To its north, stand the Markazi (Central) Province and the provinces of Qom and Semnan. Counties: The city of Isfahan is the provincial capital; and the counties of this province are as follows: Aran va Bidgol, Ardestan, Isfahan, Shahinshahr and Meymeh, Khomeini Shahr, Khansar, (The Upper) Semirom, Fereydan, Fereydunshahr, Falavarjan, Kashan, Golpayegan, Khomeini-shahr, Lanjan, Mobarakeh, Nain, Najaf Abad, Lower Semirom (Dehaghan), Shahreza, Anarak and Natanz; 18 townships, 38 counties, 67 cities, and 2470 villages in all. 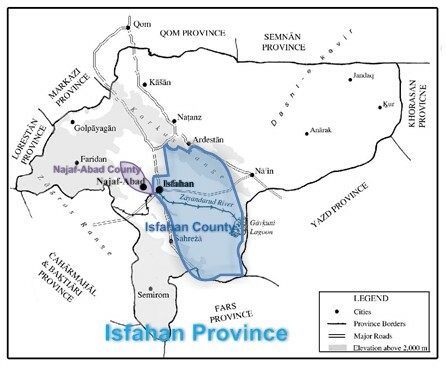 Isfahan county: Its capital is the city of Isfahan.It covers an area of approximately 15853 square km and had a population of 1986542(2006 census). Najaf-abad county:is a county in the northwest of Isfahan county. Najaf-Abad is the capital of this county. With the area of about 2342 square km it had a population of 282430 at 2006. Population: According to the census in the year 2006, the population of the province was 4,559,256 of which approximately 83.3 percent were urban residents and 16.7 percent resided in the rural areas. The literacy rate was 88.65 percent. Climates: The province experiences a moderate and dry climate on the whole, ranging between 40.6 °C and 10.6 °C on a cold day in the winter season. The average annual temperature has been recorded as 16.7 °C and the annual rainfall on an average has been reported as 116.9 mm. The city of Isfahan however experiences an excellent climate, with four distinct seasons. Cities: Isfahan or Sepahan (Persian: Isfahan), historically also rendered in English as Ispahan or Hispahan, is located about 340 km south of Tehran and is the capital of Isfahan Province and Iran's second largest city (after Tehran). Isfahan city had a population of 1,583,609 and the Isfahan metropolitan area had a population of 3,430,353 in the 2006 Census, the third most populous metropolitan area in Iran after Tehran & Mashhad.Isfahan is located on the main north-south and east-west routes crossing Iran, and was once one of the largest cities in the world. It flourished from 1050 to 1722, particularly in the 16th century under the Safavid dynasty, when it became the capital of Persia for the second time in its history. Even today, the city retains much of its past glory. It is famous for its Islamic architecture, with many beautiful boulevards, covered bridges, palaces, mosques, and minarets. This led to the Persian proverb 'Isfahan nesf-e jahan ast (Isfahan is half of the world). The Naghsh-e Jahan Square in Isfahan is one of the biggest city squares in the world and an outstanding example of Iranian and Islamic architecture. It has been designated by UNESCO as a World Heritage Site. The city also has a wide variety of historic monuments. Najaf-abad city:is a capital of Najaf-Abad county. In 2006 it had an estimated population of 208,647 . It is located west of Isfahan and is increasingly becoming a part of Isfahan Metropolitan area.The city serves as a trade center for agricultural products in the region, and is noted for its pomegranates.One of the attractions of Najafabad is Arg-e Sheykh Bahaie that has recently been repaired.